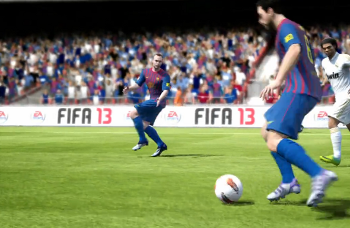 Much like its predecessors, FIFA 13 is all about knowing when to pass and when to dribble. As it is significantly tougher to go on winding runs that weave through your opponent's defense, you'll have to rely on passing even more in FIFA 13, making it one of the most important skills in your arsenal. So yeah, FIFA 13 is all about passing. I highly recommend you at least take a look at my full review to the Premier FIFA 13 Guide which features a lot of strategy regarding passing. I give a good rundown of passing tactics and everything below, but you should consider the guide. Read my review first to decide! The possession game in FIFA has always been very similar to what it's like in real life: hold the ball, pass it around, and wait for the moment to surge forward. If you have a team who isn't exactly the "sit back and wait for the counter attack" it's probably in your best interest to maintain posession in the midfield and slowly work it upfield. Try to emulate teams like Barcelona, who focus on the little layoffs and utilize all areas of the final third. Don't be afraid to pass back, it opens up more options, and it's certainly better than loosing posession. There are always pockets of space on the pitch where the defending team is nonexistent. You must look at the current defensive shape of your opponent, are they spread out all around, leaving many available passing lanes? Or are they cluttered more in the center of the field, leaving options for you to play the ball outside? You need to learn to analyze how your opponent's team is positioned, and take advantage of this. A good example would be that from a goal kick, the defending team tends to push into the center of the field, leaving your wingers or outside midfielders wide open. If you are to win the header, play the ball to any open player, who can then distribute it to your winger or outside midfielder. Another example is playing against a team who is very spread out, which is usually due to his formation featuring many midfielders and defenders. By noticing this, you already have the advantage that there will be more passing lanes than normal, and the through ball will be extremely effective. By pressing the default passing button of your gaming console, you play a simple sidefooted pass to a teammate. These passes will generally go right to your target's feet, so if they have a lot of room in front of them to run on to, you might want to consider the through ball, which will be explained later. Although the default assisted controls will aid your passing direction and power, you do have a considerable amount of control over the power of your pass, so analyze the distance between you and your passing target and hold down the passing button accordingly so it gets to him without being intercepted. However, if you want full control over the direction and power of your shots, I highly recommend looking into changing your passing settings to manual. The lofted pass is useful when your passing target is wide open, but there is a player of the opposing team in the way of this. By simply lofting the ball over your opponent's head and to your target, you can evade this problem. Another useful time to utilize the lofted pass is by passing up to a big, tall striker. Most of the time, he will out-jostle and out-jump the defenders to head the ball to another player or even chest it down to his feet. This is useful because when done well, it is so sudden that the midfielders don't have enough time to get back, and you can attack just their back line. Crossing is an incredibly useful tool in FIFA 13. Utilize your quick wingers and get them down the line to play a cross in. However in FIFA, you can decide what kind of cross you want to play. There are three types of crosses in FIFA 13. The Traditional Lofted Cross: by holding down the lofted pass button on your console, your player will play in a cross that tends to go high enough that heading the ball is the best option for your strikers. The Low Cross: by tapping the lofted pass button down twice in quick succession, your player will play in a lower cross to the ground that is usually put away by not only headers, but also volleys. The ideal time to use this is when your striker us approaching the near post and there is not a defender in front of him, or when the player who is going to cross the ball is very close to the end line. The Ground Cross: a ground cross is executed by tapping the lofted pass down three times in quick succession. This will result in a ground level, hard cross across the face of goal. This is useful for when the defensive line is rushing back to the goal to defend the cross but haven't quite made it there yet. If your striker is in line with the defence, but is faster and will beat them to the ball, then go for it. When done well, the cross will nestle right in front of your striker nicely for him to bang into the back of the net. *Holding down LB on Xbox or L1 on Playstation while crossing with any of these three crossing variants produces an early cross which is best used when your strikers are still not quite into the area, so you play it into their path to run on to. The through ball is an incredibly dangerous weapon to use against your opponent. The through ball is a pass which doesn't go directly to your passing target, but rather in front of him for him to run on to. Obviously, don't try this if your target doesn't have space in front of him, or if his marker or defenders around him are faster than him. The best uses for the through ball are for when playing wingers to give them a head start on their dribble down the line, or playing through holes in the defensive line so your striker can simply run past the defenders to be in on goal. The through ball can also be utilized to quickly speed up your attack in the midfield also, your midfielders will have space in front of them too! Chipped Through balls have the same concept as the regular through ball, but that the pass is, well, chipped! This is useful for when your passing target has a lot of space in front of him and is faster than the defenders around him, but they are blocking passing lanes through which you can play a grounded through ball. A new feature in FIFA 12, Fancy Passes continue in FIFA 13. You can control when you want to play a little backheel or another fancy flick by holding down RB on Xbox or R1 on Playstation as you execute a pass. It's not always the same type, but they're all equally as effective and always cool-looking. It's not such a good idea to do this all the time, just occasionally as they aren't all that effective when compared to regular shots.